Uttarakhand Board of Technical Education Roorkee (UBTER) has released answer keys of various Groups C Examination for the recruitment in different Government Departments. 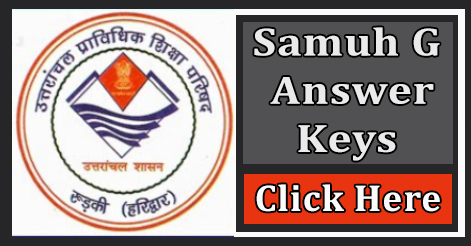 Answer keys of all four series – A,B,C and D are available now for Samuh G Exams conducted by UBTER in 2018-19. Check out the answer keys of different posts code and series of Group C or Samuh G Exam in Uttarakhand. Help us to improve this article/job posting "UBTER Samuh G Answer Keys Released". We would be glad if you can comment below and provide your valuable suggestions and feedback. If this page have any wrong information/list or out of context content, then you can report us as well. group code 70 answer key kab ayegi . Sir pls tell me about the answer key of post code 66.
paper fornat kya rhega post code 056 ka?? any idea?? Sir code 071, 266 ka result kab aayga plzzzz answer me sir…..
Sir when will post code o56 answer key upload…..
when the result is declared?? Sir, how can i download VDO answer key . sir code 56 ka result kb tk aayega ??? sir code 56 ka result kb tk aayega?? Bhai kon se group mai ? Code 254 assistent librarian vale paper mei do question me answer ,answer key mei galat hai…. Sir mera roll no.1925210170 hai padh code 092 ka result kab ayega. @Paras kumar …268 ki answer ki ubter ki website py available h….tumare final marks kitne bn rh btana ?